Discover the new intuitive usability of our new 4.3-inch, color TFT touch display. Use the interactive menu guidance you can select your drink individually and create a personal profile - easily with just a tap. As convenient as never before. All drinks, espresso and latte macchiato from can be adjusted to personal preference. 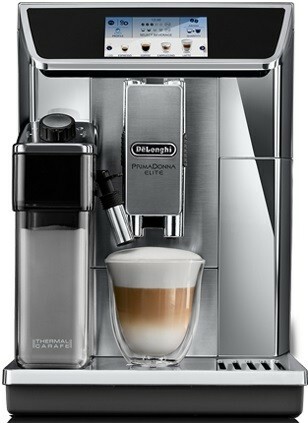 The Primadonna elite enjoy your favorite coffee drinks as well as you drink it the most. The first De'Longhi coffee machine, which allows you thanks to App-Control to select your favorite coffee drinks and unlimited personalization discovering new coffee recipes. Let yourself be inspired for a delicious hot chocolate. Thanks to the special decanter and the magnetic stirring drive to a creamy hot chocolate from chocolate powder and milk. Automatic milk function "Latte Crema System"